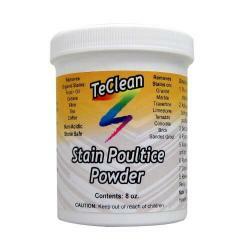 TeClean Marble & Granite Stain Removal Poultice Powder makes removing stains in natural stone a snap. 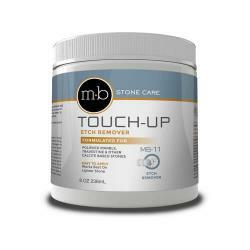 Use for coffee and wine stain removal, grease and cooking oil stains, urine stains and other organic stains in granite, marble, travertine, limestone, terrazzo, all natural stone and other porous surfaces. 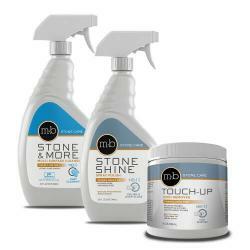 Excellent for concrete stains and grout stain removal. Quick and easy DIY application. Granite and marble stains are caused when a substance absorbs into the pores of the stone creating a dark spot (not to be confused with etching, which leaves a dull and light-colored spot). 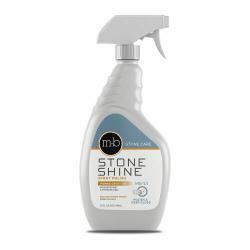 Stains cannot be simply scrubbed away and must be drawn out of the stone. 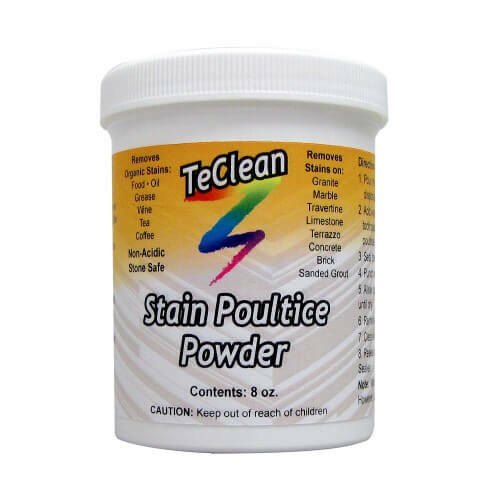 This specially-formulated and powerful DIY stain remover poultice works deep into the stone to lift out and remove the staining substance without damaging the countertop or tile surface finish. Scoop out the amount of powder needed to cover the stain as indicated below. Mix with water to make a paste with the consistency of toothpaste (smooth, spreadable, but not runny). Apply poultice paste to the stain 1/4 inch (.65 cm) thick and exceeding the edges of the stain 1/2 inch (1.25 cm) . Cover entire poultice with standard plastic wrap making a few toothpick holes in the plastic wrap. Let sit until the paste is completely dry and hard (typically 24-48 hours). Remove the poultice paste and the stain will be gone. Some stains may require repeat applications. Continue with repeat applications until stain is removed. Did NOT work for me - applied several times and NO Difference. Would Not buy again. +++++++ Countertop Specialty comment: We apologize for you didn't get the expected results. Note that we are happy to help provide diagnosis and guidance. Stone care is sometimes more art than science and some stains cannot be removed no matter the product or method. However, if you saw absolutely no change, it is likely you did not have a "stain" but rather a different issue like etching. I tried this as a first step to remove light stains - circles, nearly square and other light stains from my Absolute Black Granite. It did not work so I tried acetone next. 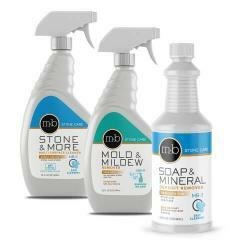 After reading on this Web site that there are varying types of Absolute Black I am going to next try Methyl Chloride. The poultice powder was worth a try but did not work for me. ******************* Countertop Specialty comment *** The light marks and circles on your black granite are etch marks and not "stains". 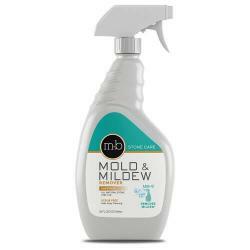 This Stain Removal Poultice will only remove stains (dark spots). It will not repair or remove light-colored or dull etch marks. 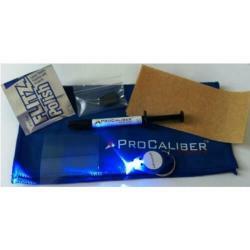 Please know we will answer any questions prior to purchase to help diagnose the issue and choose the correct product.